We're officially two months away from the New Year, which means that a lot of you are thinking about your 2014 fitness resolutions and goals. Whether it's losing weight, toning up, gaining strength or boosting confidence, this 30 Day Squat/Plank/Push Up Challenge for the month of November has you covered! Squats are a full-body exercise, primarily training the muscles of the buttocks, hips and thighs. Squatting is something we do repetitively in everyday life, and the exercise of squatting is a wonderful way to shape up the lower half of your body. Proper squat technique is key for injury prevention and effectiveness. To execute a proper squat, follow these steps and watch the video! 1. Keep your shoulders back and tilt your chin just slightly up. Chest should be up and out to support your back in its natural curve. The back should never be rounded, and the shoulders should not slouch forward. Keeping your back straight or slightly arched as you squat is *extremely* important to prevent injury. 2. Keep your core engaged and your feet about shoulder width apart. Toes should point just slightly outward. Feet should be firmly planted and weight should be evenly distributed. Make sure that your body is centered- don't lean to one side or rely on one leg more than the other. 3. Remember to BREATHE! As you lower yourself down into squat position, take a deep breath in. When you rise back up, exhale. Whatever you do, don't hold your breath! This depletes you of energy and can cause lightheadedness. 4. As you come down into squat position, ensure that you are sitting into your glutes like you're sitting into a chair. Don't let your knees roll over your toes. Come down to a ninety degree angle. If you are very flexible and have some experience with squats, you may lower yourself with your hamstrings below parallel to the floor. Slowly rise up into standing position, and repeat. Push ups are a classic upper-body exercise, working the chest, shoulders and triceps. There are a few ways to do push ups, depending on your fitness level and experience. The classic push up: The classic pushup is suitable for those of you who have significant upper body strength and are engaged in a regular exercise program. With the classic pushup, form is extremely important. To do a classic pushup, get down on the ground and set your hands just slightly wider than shoulder width apart. Plant your toes into the ground- the wider apart your feet are, the more stability you will have when you perform your pushup. Your body is now in a straight line. Your head should be pointed straight ahead and your back should be straight. Never arch your back; don't let your hips collapse to the ground. Squeeze your glutes and tighten your abs as you lower yourself down to the ground until elbows are at least at 90 degrees. Once you're almost all the way down to the floor, push yourself back up and repeat! The modified push up: The modified push up follows the same formula as the classic pushup, except the knees remain on the ground. Lift your feet and cross your ankles with your knees on the ground, and lower yourself down to the ground. Repeat! Modified pushups are great for those of you who have recently started exercise again and are looking to build a bit more strength before moving onto the standard pushup. Alternatively, you can start your reps with a standard pushup and move into the modified pushup when standard pushups become too challenging to hold proper form. The wall push up: Wall push ups are perfect for those of you who are just starting out with an exercise program and have no experience with standard or modified pushups. To execute a wall push up, find a large, empty wall and stand facing it just about 1 meter away, or 3 feet. Your hands should be touching the wall. Lean your body into the wall and gently push back until you are in a standing position. Repeat. 1. Lie on your stomach on a flat surface with your elbows by your sides and under your shoulders. Your forearms should be resting on the ground. Engage your core muscles. 2. Lift your torso off the ground and squeeze your glutes, as if you were doing a pushup. Tighten your abdominal muscles. Your body should be in a straight line from nose to toes. Hold that position. Many people used to believe that if you exercise regularly, the weight will just fall off. As we now know, this isn't the case. Diet plays a HUGE role in weight loss and fitness success- about 70% to 80%! Exercise is a necessary supporting actor but without a healthy diet, your goals may be next to impossible to reach. That's why I've thrown in a bonus nutrition challenge for November. It's not complicated, and it doesn't involve calorie counting, pre-packaged meals, juice fasts or eating in every night. What it requires is only that you eat as nature intended, enjoying WHOLE, FRESH foods like fruits, vegetables, berries, legumes, seeds, nuts, fish, and lean protein. What you'll eliminate is all the processed, artificial junk we seem to rely on so heavily these days. That means no sugar, no white flour, no white rice, no cakes, no cookies, no candies, no breads, no pastas, and no chemicals. I'll leave dairy up to you, but remember, if refined ingredients have been added, it's out. Greek yogurt is ok... ice cream, not so great. I highly recommend giving this nutrition challenge a chance. You may just find that after 30 days, you look and feel incredible! We all start from different places, and we all have our own challenges to overcome. In this challenge, all I ask is that you do your best. If you cannot reach an exercise goal with consecutive repetitions, just take a little break and get right back into it. For instance, if you've held 2 minutes of plank and you feel like your back is starting to cave in, get out of position immediately, take a break, and resume the plank when you're ready. There's no time limit to these exercises- just go at your own pace. Who's in?!? Who's ready for action!?! Who's starting TODAY!?! Check in to the Tangram Fitness Facebook page for regular updates and email me with any questions you may have at aimee@tangramfitness.com. If you need additional support, reach out via email. 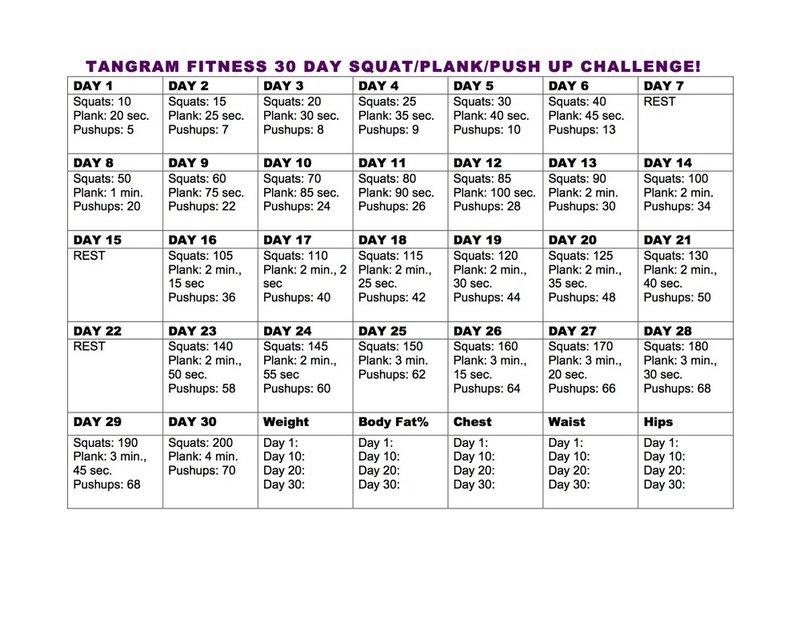 If you choose to follow the Tangram Fitness 30 Day Squat/Plank/Pushup Challenge, you do so at your own risk. These exercises are not intended to be taken as professional advice or “personal training.” I am not a physician or registered dietitian. As always, consult a doctor before you engage in any rigorous exercise program. Like us on Facebook for daily fitness and wellness support!